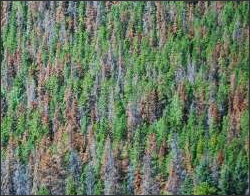 Scenic shots of Rocky Mountain National Park, Mountain Pine Beetle damage to pine forest. Apr 11, 2012 • Part of the challenge for understanding how forests are affected by climate change is the need for long-term data. Satellites are a cost-effective way to gather wide-spread information on forests, and the Landsat program has been doing so across the globe since 1972. Landsat records provide the world’s longest continuous collection of space-based data. Long-term monitoring and sound science on climate change impacts to our forests is needed to make the most informed decisions to protect these environments. This entry is filed under Carbon and Climate, Forest Management, News.